The Children at the Royal Court. Do not go gentle into that good night, the Welsh poet Dylan Thomas mused, possibly over the impending death of his father. Old age should burn and rave at close of day; Rage, rage against the dying of the light. The Children begins with a dying of the light – the warmth of a coastal sunset bathing the insides of a tidy cottage kitchen. The couple (Hazel and Robin) who inhabit that cottage and their unexpected visitor (Rose), all in their 60s, are beginning to feel the creep of that close of day. A great disaster has recently occurred not far from this cottage, in an echo of the earthquake-tsunami that wrecked Japan’s Fukushima and its nuclear power stations in March 2011, and there is a palpable sense that the familiar world might heave off its axis. “I could see it; the radiation hanging in the air,” Hazel, a retired nuclear engineer, tells her former colleague Rose, “a sort of filthy glitter suspended”. 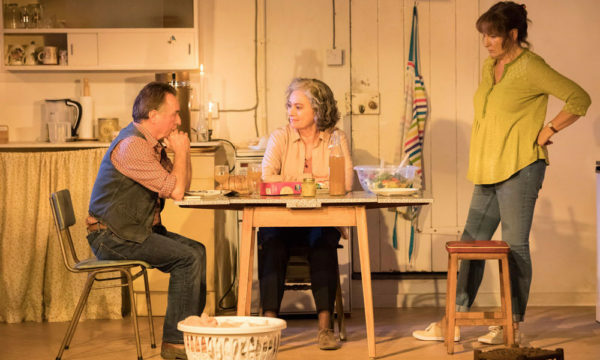 This radioactive fallout becomes an insistent metaphor for the play, as Lucy Kirkwood (Chimerica, NSFW) peels away at her characters’ buried fears throughout this moving inversion of the kitchen sink drama, exposing what is at once a core of decay but also a throbbing, excited nucleus. Birth and death, living and dying, love and loss, children and parents – all of these ideas collide and crumble in Kirkwood’s nuclear reactor of a text, which often asks more questions than it answers. What matters most in the wake of a near-apocalyptic event? What does one generation owe the next? Are our children the only things that truly tether us to this world? How does one find meaning in the inevitable journey towards death? Director James Macdonald also helmed Caryl Churchill’s Escaped Alone, and The Children sometimes feels like it inhabits that same universe of apocalypse and tea, where the disaster-dystopia is not just one that hovers beyond the kitchen door but also invites itself in and makes itself at home. For all of its talk of explosions and spontaneous devastation, The Children is also a measured, careful play. It plots out the relationships between its three characters in meticulous trajectories. It’s also darkly and astutely funny. We are first introduced to Rose (Francesca Annis) and Hazel (Deborah Findlay), old friends who have not seen each other in nearly 40 years. Rose is aloof, collected, angular; Hazel is warm, garrulous, loose-limbed. They circle each other warily, testing for weaknesses, sniffing out motives, talking too much, trying to piece together their decades apart. The room is heavy with what is unspoken and what each woman is afraid to ask. Enter Robin (Ron Cook), Hazel’s husband and also a retired nuclear engineer, and the air stiffens and flexes with mischief and sexual tension. Often it is the tiniest of gestures that matter: taking a mug from a cupboard or the flick of ash from a cigarette; the same goes for the reams of subtext behind the simplest of statements (“Would you like a glass of water?”). And as the sunset outdoors fades into candlelight indoors, shadowy personal histories and the real reason for Rose’s visit soon come to light. Kirkwood takes her time with these revelations, and many of them converge abruptly and a tiny bit too coincidentally towards the close of the play; then there’s the occasional slip-up in choosing words that feel exactly comfortable in the mouth of their speaker. But this ambitious dissection of friendship, marriage, parenthood and mortality manages to reach far beyond its on-stage confines of a kitchen. It’s a kitchen that could very well be our own, and within it the trio rage against their twilight years and the unstoppable churn of time. Where Chimerica plunged into the past, The Children pitches into an uncertain future. Save for a panicky few minutes where lines were forgotten during a monologue, the three actors are tight-knit and deeply familiar with their characters, giving them a lived-in intimacy. We feel the weight of Hazel and Robin’s decades of marriage, their comfort with each other and the things they take for granted. Annis and Findlay, as estranged friends, play off each other wonderfully as the diametrically opposing personalities of Rose and Hazel, bringing up the small jealousies that can erode a friendship, the veiled rivalries, the hidden admiration – and they are leavened by Cook’s genial, flirty Robin as a fitting complement to them both. “Think of the the children!” the refrain often goes, but sometimes we forget to think of the parents. Night eventually falls, but none of them go gently into it. They cling to any anchor they can find. Parents become children as they dance to a favourite song; a brush with death turns to life when a character survives; living turns to dying when a sacrifice is made; and the cycle goes on. Like Thomas’ famous villanelle, the lines overlap and repeat, but they bring something new with them each time. The Children is on until 14th January 2017 at the Royal Court. Click here for more details.